Entries close 12 noon 10th October 2015. Exhibition grand opening will be 7:30pm Friday 30th October Beaufort Manor, Yea. Tickets $10 a head or $20 a family. Over $2000 in prizes so don't be shy, give it a try. There is a section for photographs taken in the Murrindindi Shire and sections for novices so there is a chance for you to win. 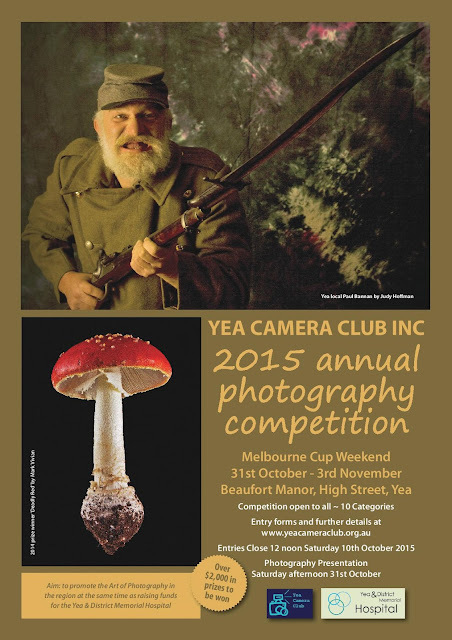 Come visit the area or get out and take some interesting photos and enter. Just $4 per entry and no limit to the number of entries you can make.